You can see which blogs act as entry points to the website, over a period of time. This may help to identify subjects that you could further blog about to get more visibility. You can analyse where people go after viewing each blog page. This helps you to decide whether there needs to be more calls to action within the blog pages. You can measure the success levels of the marketing activities and costs used to drive traffic to those blogs. Analysing blog-related traffic is going to be a lot easier if you have a specific structure to your blogs. Many websites have them within a url structure such as /blog or /news. Some websites, including WordPress-based websites, will have blogs denoted as starting with /201 (e.g. /2016, /2015). If your website doesn’t have a set structure that makes it easy to filter by blog views then it’s recommended to invest in that aspect of website redevelopment as the benefits will outweigh what are likely small costs. 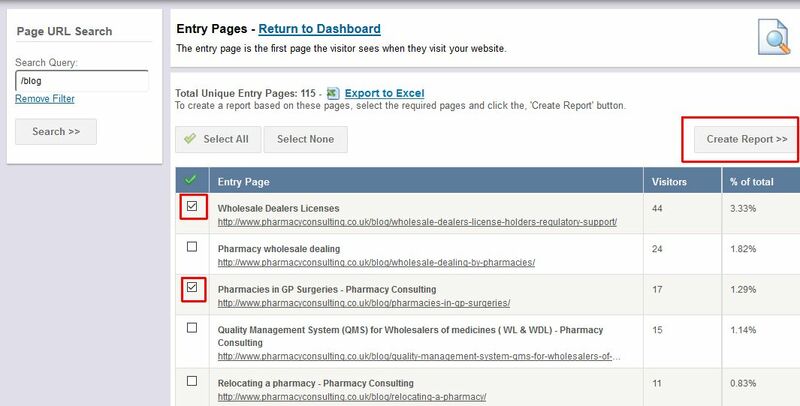 There are two ways you can view blogs within the A1WebStats system. Both are accessed by the Pages navigation bar option, within which you can select either Entry Pages or Visited Pages. You can then filter using the Search Query box in the top-left of the page. In the example below we have filtered by any entry pages that have /blog in the url. That gives us an at-a-glance view of how many visitors landed on each individual blog page over the period of time that we’re analysing. 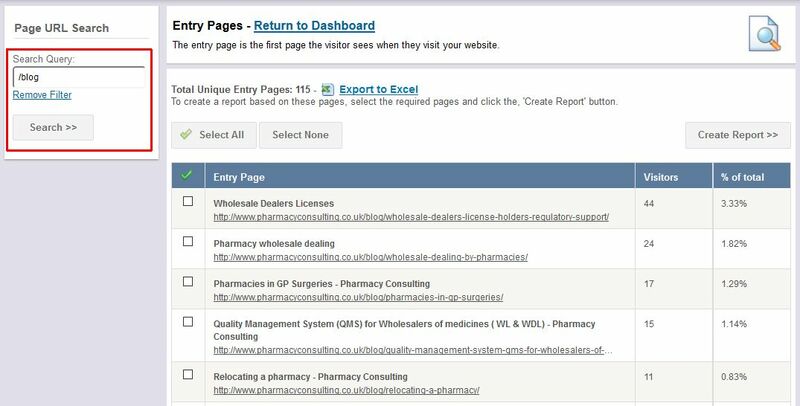 For each blog we’re interested in we can tick the box to the left of the blog followed by clicking on ‘Create Report’. This will then show us all the visitors who landed on that blog and how they did (or didn’t!) move on to other pages within the website. 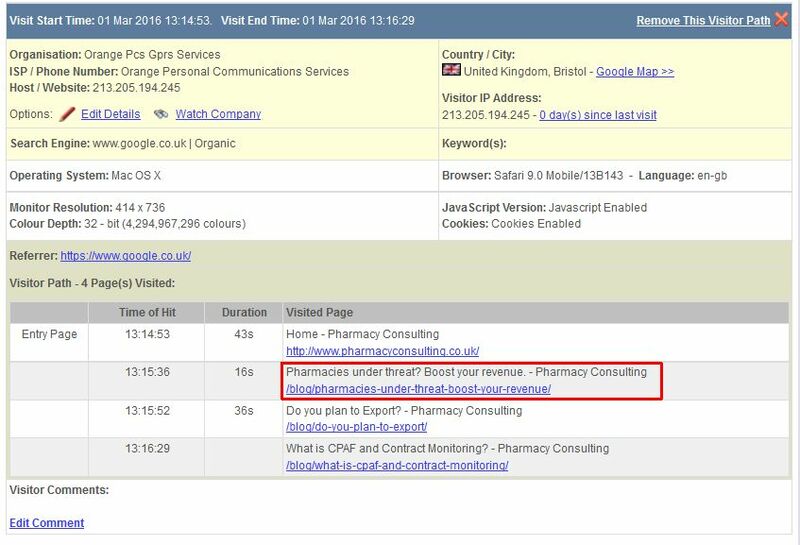 The example below shows someone who landed on a blog page and went on to make contact after looking at other pages. It’s normal to have the majority of people go no further than the blog page they land on. However, if there is active marketing of that blog (including paid marketing) then it is logical to expect a return on investment, which is why it’s useful to analyse where people go after clicking through to a blog page. 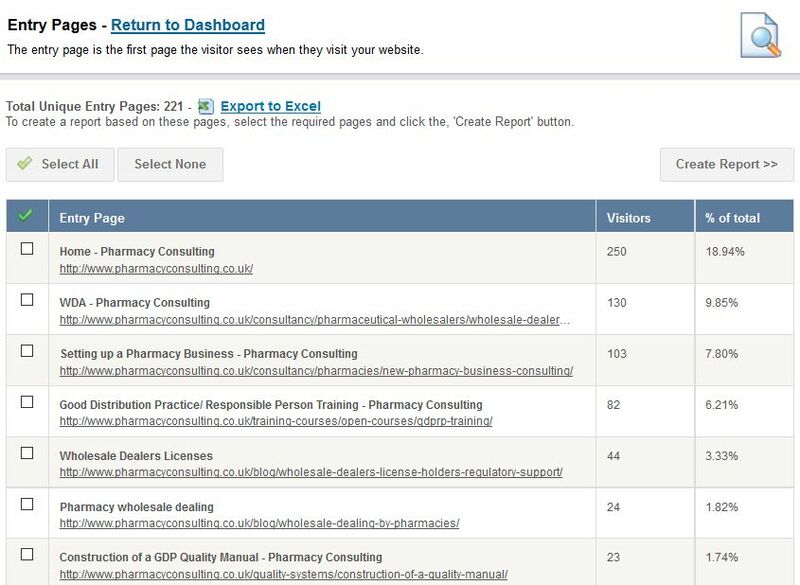 Looking at the example below, showing people who entered the website via various blogs over several months, there are some good numbers of visitors and so there should be expectations of some of those visitors then going deeper into the website and then making contact. If your statistics are showing little engagement beyond the click into the blog page then it implies that there are opportunities to strengthen the calls to action. 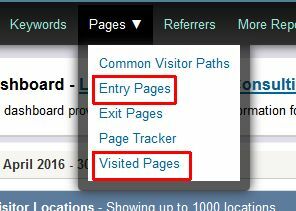 Not all blog visitors will land directly on the blogs and so you can use Visited Pages from within the Pages navigation bar option to see how many overall views there have been of each blog. The example below shows the overall number of visits to each blog, which would include those who entered the website via each blog page. 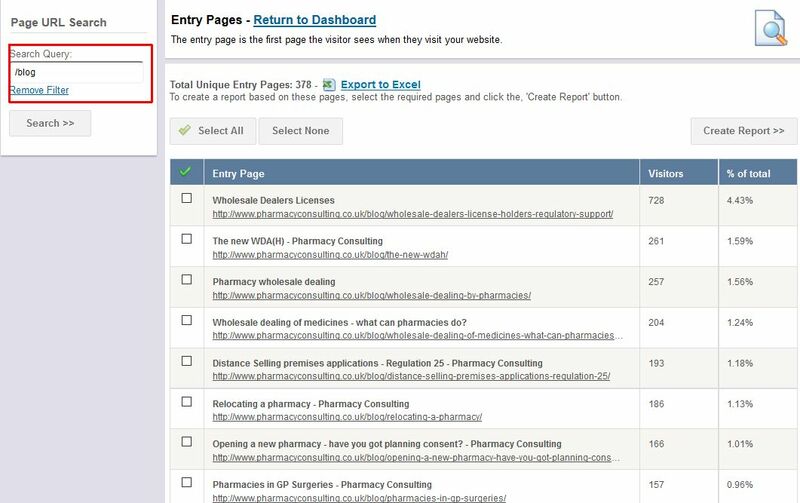 To dig deeper into how people navigated through to the blog, you can tick the box(es) to the left of the blog(s) of interest and then click on ‘Create Report’. 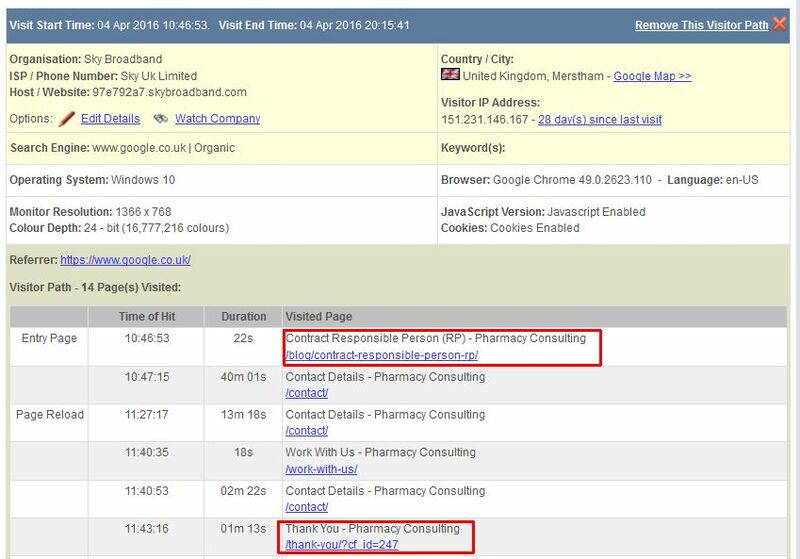 The example below shows someone who entered the website without landing on a blog page but navigated to the blog as part of their visit.